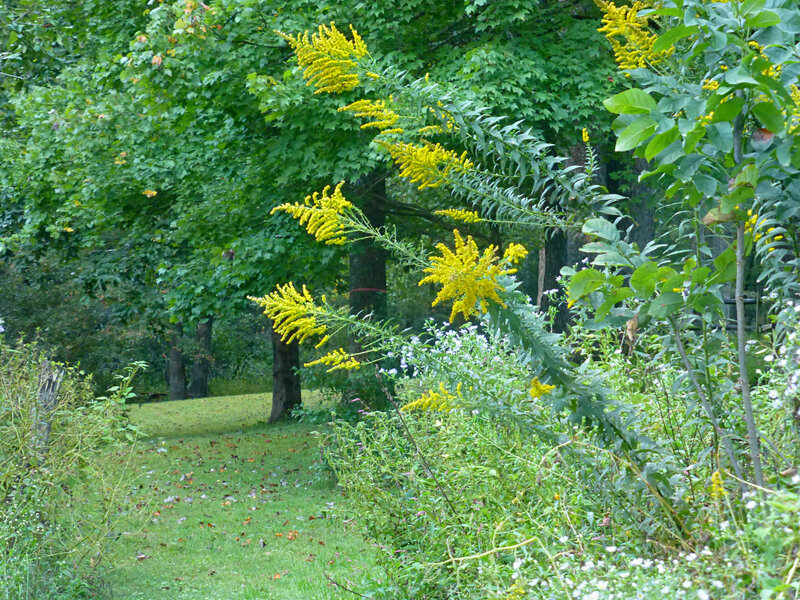 Little hints of fall color at Inn on Mill Creek…the fall color show starts soon! The fall foliage experts tell us that we can expect a lovely, long fall season this year here in the mountains of western North Carolina, thanks in part to our dry July and wet August, and a warmer-than-normal summer. The area experienced moderate drought conditions this summer, meaning some trees will change earlier in response to the drought and others will change a little later. So, while we always have a gradual fall season that lasts more than seven weeks (the leaves don’t all change at once), the season may actually be extended even longer. One reason we have a long fall season in the North Carolina mountains around Asheville is the varied elevation coupled with a ridiculous number of tree varities. You can go from 1,000 feet above sea level to over 6,000 feet above sea level in just over an hour’s drive and see many different tree types along the way. Higher elevations see fall foliage as early as late September, and the color slowly migrates down the mountains through October and into the first part of November. So let’s talk trees. What’s starting to turn? 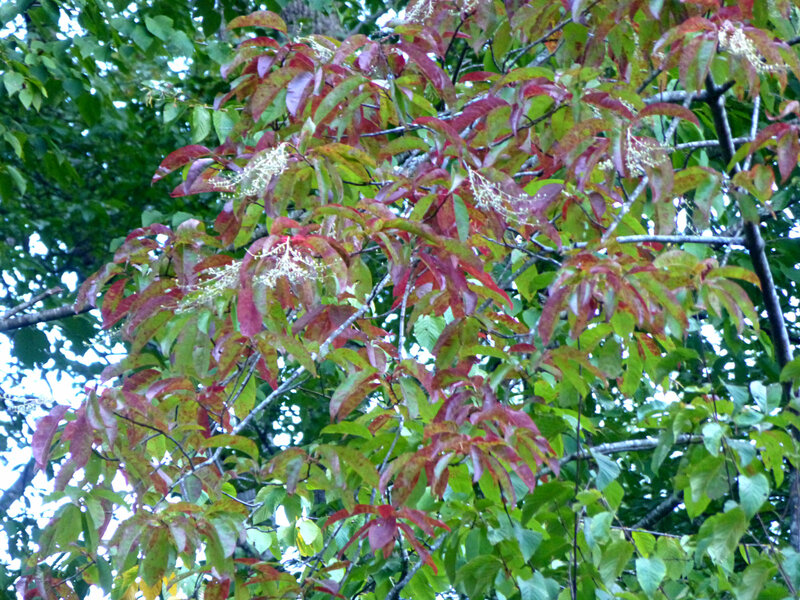 This week at our elevation (2,300 feet) inside Pisgah National Forest, we’ve noticed dogwoods, sourwoods, sassafras, walnut and birch showing a little bit of color (emphasis on “little bit”…it’s still quite early in our neck of the woods for color change). Maples have leaves changing here and there, but are just getting started and will likely really start revving up their color in a few weeks. Tulip poplars, our perennial “hope for better color after suffering drought conditions several years ago” trees, just don’t seem to be coming out of it and will likely see another fall season of more brown than yellow from what we see so far. Most other trees, including beech and oaks, are still green. 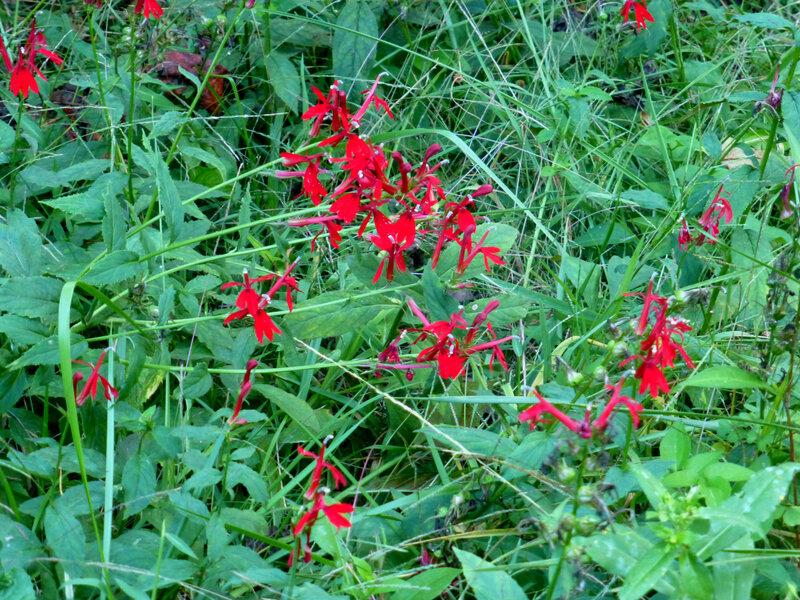 Typically, early fall is a time to look down for color because we have some stunning wildflowers and native plants that show off in late September. 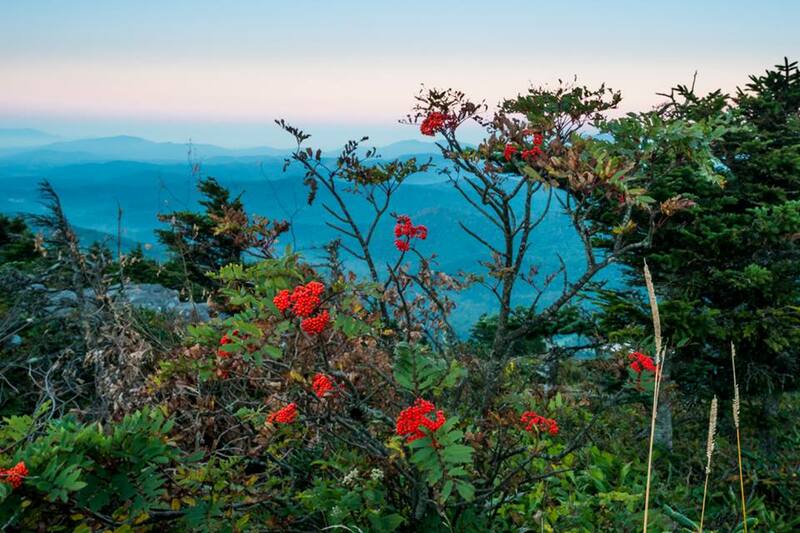 The red leaves of wild blueberry bushes, sunny yellow goldenrod, purple aster, fire engine red cardinal flower and more provide us with beautiful pops of color in the Asheville area while we wait for the leaves above our heads to begin the fall foliage show. This year, to maximize your opportunity to see fall color in the mountains, we’ll be recommending three categories of hikes/walks each week. Our categories are [drum roll…]: Fall Color Waterfall, Walk in the Woods, and To a View. Fall Color Waterfall: Head south to Chimney Rock State Park, located about 30 to 40 minutes from the Inn on Mill Creek B&B depending on your route. The quickest way is to head south on Hwy 9 from Black Mountain. 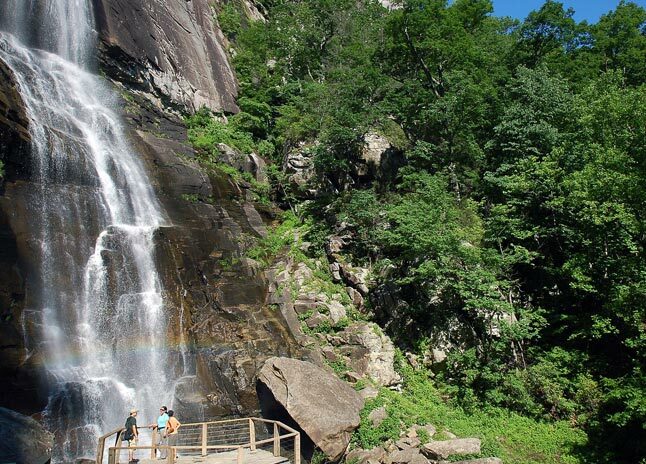 The leaves at Chimney Rock don’t start changing until later in the season, but a hike on the Hickory Nut Falls Trail will reward you with wildflowers and the 404-foot Hickory Nut Falls. More details at www.chimneyrockpark.com/view_trail/hickory-nut-falls-trail. Walk in the Woods: Grandfather Mountain, about 45 minutes northeast of the Inn on Mill Creek via Highway 221 north out of Marion, has a beautiful woodsy walk on the aptly-named Woods Walk Trail. See a description at www.grandfather.com/things-to-do/walking-hiking/nature-walks. In addition, Grandfather Mountain is at a higher elevation, and sees earlier fall color changes than other areas in the mountains so you might catch some trees starting to change. 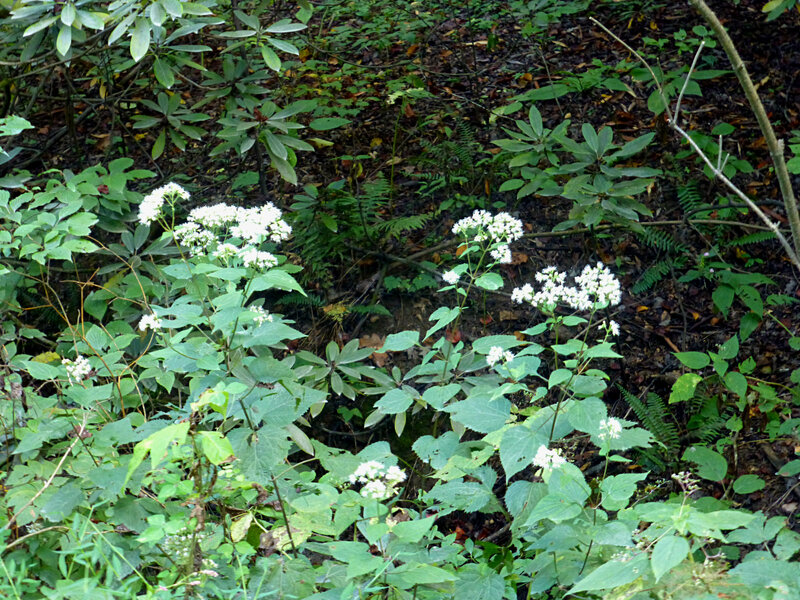 While you’re there, also keep an eye out for the amazing red berries of the mountain ash tree, which typically mark the start to the fall season in the area. To a View: A favorite hiking place for many of our guests, Mt. 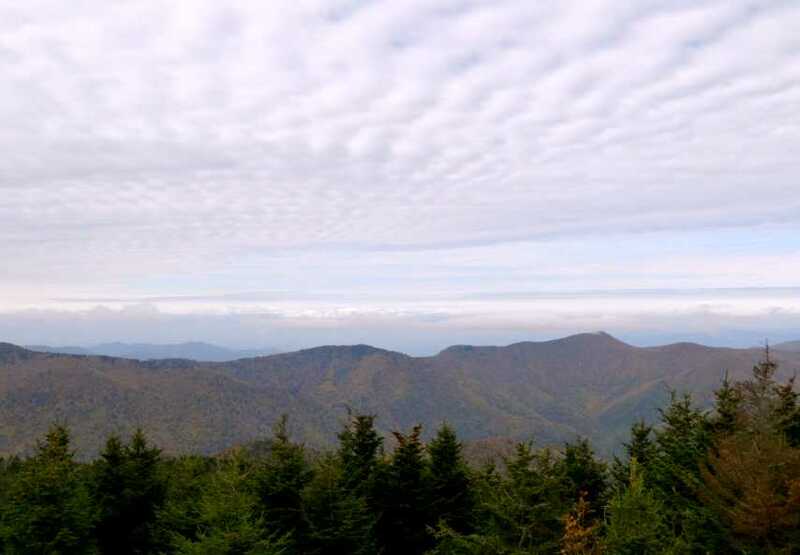 Mitchell State Park provides great views – the main reason being that it is the highest peak in the eastern United States! At 6,684 feet above sea level, many of the tree species are evergreen, such as fraser firs and spruce pines, but at Mt. 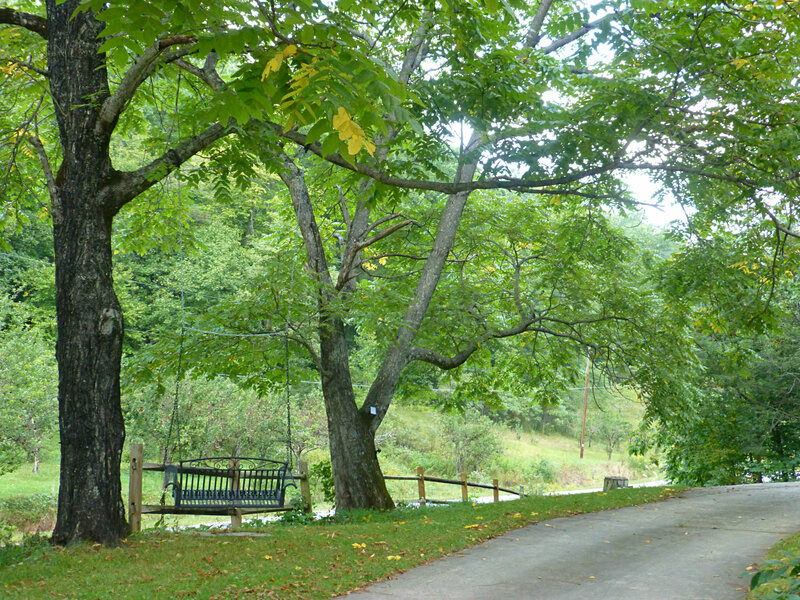 Mitchell State Park, you get panoramic views to watch the beginnings of beautiful fall foliage. One hike that will take you to a view (more than one view, actually), is the first section of the Deep Gap Trail, which goes from the peak of Mt. Mitchell along the ridgeline to the next highest peak, Mt. Craig. You can find a good trail description at http://ashevilletrails.com/mount-mitchell-state-park/mount-mitchell-deep-gap-trail-mount-craig. This entry was posted in Fall Color Reports, Fall near Asheville, Hiking and Waterfall Trails and tagged Blue Ridge Parkway, fall foliage, Grandfather Mountain, hiking, outdoors by Inn on Mill Creek. Bookmark the permalink.